The Mildenhall Stadium at West Row was built in 1975 on former agricultural land. A motor sports stadium says it is facing a £1m legal bill after a defeat in the courts in a long-running dispute over noise. Katherine Lawrence and Raymond Shields bought a bungalow in 2006 near the Mildenhall Stadium in Suffolk. The couple, who lived on Cooks Drove in West Row, had already been awarded £20,000 compensation in the courts. The Supreme Court has now ruled the owners of the stadium RDC Promotions is liable for further legal costs. The final figure has not been agreed upon, but the couple’s solicitors said it would run to “hundreds of thousands of pounds”, while the stadium owners made the £1m estimate. 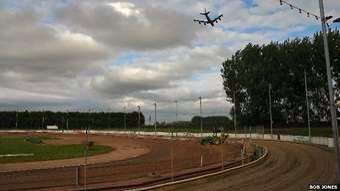 The stadium is used for Mildenhall Fen Tigers speedway meetings, other motor sports and greyhound racing events which are continuing. Mr Coventry said they may take the case to the European courts or try to reach a deal with the other side. Richard Buxton, a solicitor representing the couple, said: “They said there was no indication when they moved in there would be a noise problem, but there was and the High Court and the Supreme Court have agreed there was a noise nuisance in law. The couple are currently living elsewhere in East Anglia and would decide whether to rebuild their home when the legal battle was over, Mr Buxton said.